In the last days we improved platform-support of PyPy's Python interpreter. Jean-Paul Calderone has been tirelessly working for some time now on setting up a buildbot for translating and testing PyPy. So far the basic mechanisms are working and the buildbot is running on various machines, including some that Michael Schneider (bigdog) lets us use, one of them being a Windows machine, the other one with a 64bit Linux (lots of thanks to those two, you are awesome!). What is still missing is a nice way to visualize the test results to quickly see which tests have started failing on which platforms. There is a prototype already, which still needs some tweaking. The availability of these machines has triggered some much-needed bug-fixing in PyPy to make our Python interpreter work better on Windows and on 64 bit Linux. 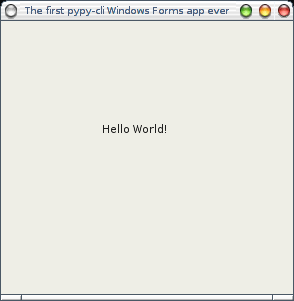 Maciek and Michael Schneider worked on this quite a bit last week, with the result that PyPy supports many more extension modules now on Windows and 64 bit Linux. Since we now have the buildbot the hope is that the support also won't disappear soon :-). So now the excuse "I can't contribute to PyPy because it needs all those special PyPy-keys" isn't working anymore :-). PyPy contains a framework for writing custom Garbage Collectors, and a few simple GCs have been written in this framework. A common issue with all these GCs is how to find all the stack roots, i.e. all the pointers to live GC-managed objects currently stored in local variables, in all the callers of the current function. The current solution is to maintain a custom shadow stack of roots, where all functions push and pop copies of their local variables of type "GC pointer". Clearly this is an overhead. Can we remove it? LLVM has recently grown some support for this. By emitting markers in the LLVM source and with the help of a bit of custom C++ code, we can generate stack maps for the functions compiled by LLVM. Then, with 100% non-portable code in our framework GC's root finding algorithm, we can walk the machine stack and locate where in each stack frame LLVM stores the GC pointers. (Yes, I mean non-portable: LLVM offers no help for doing that. Maybe it will at some point, though I didn't manage to explain why this is an issue to people working on this in LLVM so far...). I've tried that approach in the llvmgcroot branch. Over the manually-managed shadow stack, this gives speed improvements which are, very roughly, on the order of 5%. Note that this prevents some optimizations in LLVM, because it forces it to allocate all local variables of type "GC pointer" in the stack; it cannot keep them in registers and it must assume that they can be changed more or less at any time (as moving GCs do). Can we do better? This is meant to generate assembler instructions directly from C. Internally, GCC considers the whole asm() as a single regular instruction of its intermediate language; the constrains are expressed in the same way as the constrains for all the prebuilt intermediate language instructions. They express things like input and output operands of the instruction, whether they can live in memory or in registers, whether the whole instruction has side-effects, etc. The nice thing about asm() is that it doesn't kill any optimization whatsoever in GCC - it's your job to make sure that you use the correct constrains. I won't go in the details of the asm() line above - the constrains are just enough to make sure that GCC doesn't optimize too much, but don't prevent most optimizations from occurring. For example, the localvar can be in a register. The assembler will just ignore the line above; it is a comment. But what we can do is write our own tool parsing the assembler files. This tool locates the /* GCROOT */ comments and follows where the register or memory location in the comment comes from (to do this it must follow the control flow and data flow of the function). This allows it to build a stack map: for each call instruction it knows exactly which registers and frame stack locations contain a live GC pointer. The stack map is then emitted in an extra assembler file that we link with the rest. As with LLVM above, the stack map is then used at run-time by non-portable code written in our GC's stack root tracker. Yes, that's rather insane. But at least, we don't need to modify the assembler file - just read it. If GCC is too clever in its optimizations, the custom parser will get lost and complain cleanly; but I think that it is relatively safe in the sense that GCC optimizations should not be able to make the custom parser produce wrong results. The branch is not merged because it's probably too insane to merge (not to mention, it's probably not portable to non-GCC compilers, and it is completely platform-specific). Still, it gives good results, better that the pure LLVM approach - on the order of 10% to 25% speed-ups for pypy-c.
Armin and me have been working on PyPy's parser and bytecode compiler for the Python language in the last days. Armin implemented several bytecode optimizations that CPython has since a while whereas I tried to refactor our tokenizer and parser (because our existing parser is rather slow and also not very nice code). Armin is mostly done whereas the new parser is not very far yet. What is done, however, is the Python tokenizer. It is implemented in the usual way, by using a set of regular expressions to generate a deterministic finite automaton (DFA). This automaton is then turned into a big function which does the actual tokenization. Of course the picture is not quite as simple for Python, because it is not possible to tokenize Python using only regular expressions. To generate the proper "indent" and "dedent" tokens it would be necessary to keep state (the previous indentation levels) which a DFA cannot do. This is solved by postprocessing the tokens that the tokenizer produces to turn whitespace tokens into the proper indent and dedent tokens. For people who don't want do checkout PyPy I generated a (rather big) png for the DFA. 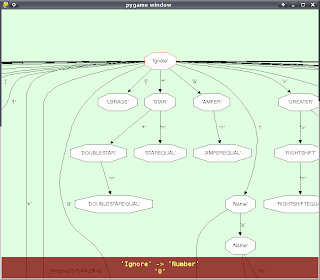 Next thing I would like to do (apart from actually finishing the parser, of course :-) ) is visualize the Python grammar itself using syntax diagrams or something similar. So far I couldn't really find a program to do that, though.